LinkedIn is about 13 years old. It was created in 2002 during the time of MySpace and and Friendster. This was during the dot-com bubble when Internet sites were viewed as risky investments. They really had to differentiate themselves at this time and it is amazing at how long it has lasted and how much success it has had along the way. This post will be dedicated to the history of Linkedin and the highlights of its affect on business today. LinkedIn revenues today come from three main sources: the talent solutions business, advertising on the page and the premium subscription model. The majority of the revenue comes from the talent solutions business, which allows recruiters to look into candidates and based on their experiences and connections and recommend them a job. The company went for its IPO on May 19, 2011 as the first social networking site to go public. 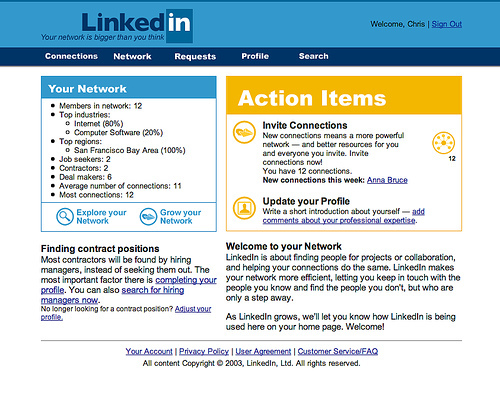 The business model of LinkedIn has changed drastically since its inception in 2002. It began as a social network to connect professionals. People could post their resume online and connect with employers that may be interested. Professionals would build credibility by having others recommend them on the site. Today, the platform has advanced into a contact relationship management service for individuals. It has changed how we acquire jobs and how we connect with employers. The goal of LinkedIn for the future in the words of the co-founder include a world where,”people are doing what the love, not just what they want to do. Where professionals understand that the work they do is one of the most significant ways in which they can contribute to their communities and the world.” This was said in 2012, so one can look at how close they have come to reaching this goal. For recruiters, the job search has transformed from the “post and prey” mentality and action to more of a hunt. If recruiters are looking for a particular person with a particular skill set, there is now LinkedIn, a place where this is advertised to the public. There are many people out there who are working but are not content at their jobs and simply do not have the time or energy to go searching for another job. This is when recruiters can take the initiative and search for the right people given their skills via a LinkedIn search. A 2013 study by the Society for Human Resource Management indicated that 77% of employers are using social media to recruit. For employers, this is a huge burden as well because current employees are constantly being poached to leave their jobs. I remember listening to many Deloitte employees talk about getting emails every single day from Google or Facebook asking if they were interested in interviewing. Of course, these are some of the top consultants in the world but this places an incredible pressure on the employers to retain their employees. My internship this past summer is a great example of a small company that has acquired some amazing talent because of the type of culture they have created. Since jobs are increasingly becoming a full-time occupation with many millennials taking work home with them on the weekends, employers have to create an awesome work environment. Furthermore, during my job search this year, I was trying to figure out how to connect with BC alumni at places I was interested in working. For the prior year, I mainly made the connections through teachers or seniors that knew someone at the company that I could contact. This year, I realized there is a group on LinkedIn called the “Boston College Career Community” so I simply searched the group for people that worked at the companies I was interested in and made tons of connections. The website helped me achieve many of the interviews I was able to and I would not know nearly as much as I do about all of the companies I am interested in if it were not for LinkedIn. It will be interesting to see where LinkedIn takes the world in the future or if it will be combined with other social media platforms to for a massive network for finding friends and professionals. At the moment, I don’t see this occurring any time soon, as LinkedIn has developed a niche in the social networking arena to provide connections for professionals and recruiters. It’s very true that LinkedIn has shifted the business world entirely. People are expected to keep their profiles incredibly up-to-date because companies use them as resumes – they even look at your LinkedIn reviews before calling references. I like the point you made about companies having to work harder to keep their employees now. LinkedIn makes it possible for recruiters to find you even if you’re not looking for a job, meaning talented employees will have more negotiating power when fighting for just salaries and benefits. As with most social media sites, LinkedIn puts the power in that hands of the people, and I think it’ll be a great tool for professionals to harness. This was an interesting read. In the past, employees made sure that there employers were unaware that they were actively searching for another job. This information would have been interpreted as a lack on commitment or loyalty to the company. LinkedIn allows current employees to “look for jobs” when they aren’t or are actually in need of one. In addition, LinkedIn allows employers/recruiters access to potential employees. It is a known fact that recruiters are paying thousands of dollars to allow employers to conduct sophisticated searches to identify people with the skill set they require. I do expect that in the future LinkedIn will be more centered on matching potential employees with recruiters and less of a network for 1st degree connections such as friends, classmates, and colleagues. Facebook will have more of that audience not LinkedIn. Interesting post! I personally love LinkedIn. It is interesting that LinkedIn is a recruiting tool, but I always wonder which recruiters are actually targeting me and which ones are simply just spamming everyone’s inboxes. As a college student with little experience, I cannot figure out why people send me messages offering me jobs. I don’t even bother to read the messages at this point. Because I ignore my LinkedIn messages, even as a desperate college student, I have to wonder how effective this type of recruiting is. Despite all of the good aspects of LinkedIn, I think it can also be negative for businesses as it is essentially an “approved” social media platform to go on at work. I know people who spend hours on LinkedIn adding and researching their coworkers or clients instead of getting work done. I wonder if there will soon be a stigma attached to going on LinkedIn at work like there is with Facebook! Thanks, @billyschloth! The strong network effects LinkedIn has created and built on will be sure to propel its growth. As @abryeans pointed out, the platform offers us virtual resumes and these matter because of the ecosystem of professionals, companies and recruiters that are on LinkedIn. I don’t see the platform becoming integrated with a purely social platform (i.e. Facebook) because people tend to want to keep their work/social lives separate but I could see it further growing as THE place for folks to search and apply for jobs. To date, it has also become my go-to tool for networking, but I could see the evolution when it comes to actually applying for jobs. I really like what LinkedIn has done. It has completely transformed how people search for jobs and it makes life that much easier when trying to connect with people. Like you, everytime I apply to a job, I search Boston College and the company name in the “Advanced Search” on LinkedIn in order to connect with someone who was once in my shoes and truly learn what it’s like to work at the company they are at. This has proven to be extremely helpful for me because people are always willing to help. I feel like their is fulfillment on both sides because some people get advice while searching for jobs and others get enjoyment out of helping those people because they know how important the people were who they reached out to while they were searching for jobs. LinkedIn has done wonders and centralizes networking. Finally, since none of us have the time to visit every company website and see if there are job opportunities, I think their job recommendations section is one of their best features that people could leverage. I agree. I’ve been fascinated by the development of LinkedIn over the years. I’m not sure that the current direction is the right one, though, really pushing content creation/ blogging by its members. Seems like alot of noise without alot of value, but I should note its not particularly relevant for my profession.